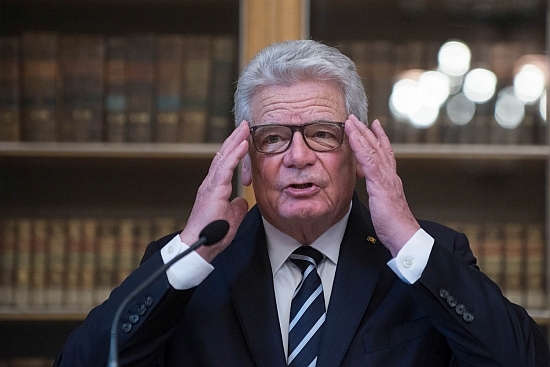 The former president of the Federal Republic of Germany, Joachim Gauck, has been awarded the international Charles IV Prize. The award was delivered to the hands of the ex-president in a special ceremony at the heart of Charles University – the Carolinum – on Monday afternoon. 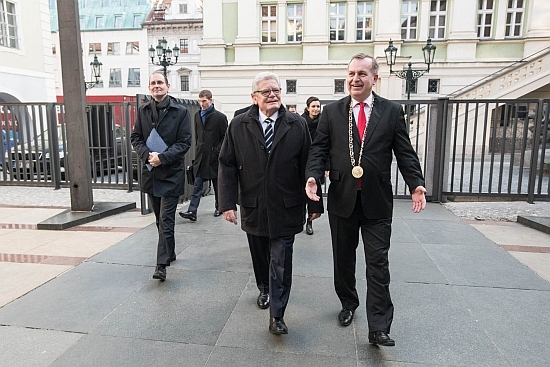 Former president of Germany Joachim Gauck at Charles University on January 21, 2019, alongside Rector Tomáš Zima. Photo: René Volfík. Ex-president Gauck is the seventh major public figure to have received the honour. Previous recipients included personalities in the fields of philosophy, music and medicine such as Paul Ricoeur, Carl Friedrich von Weizsäcker, Mstislav Leopoldovich Rostropovich, Ivan Moravec, John Foxton Ross Kerr, and Grand Duke Henri of Luxembourg. The Charles IV Prize is awarded to personalities who have acted for the greater good and left an impact in the areas of culture, science or politics - committed to democratic values and common ethical and spiritual principles within Europe. Joachim Gauck: fresh recipient of the international Charles IV Prize. Charles University, January 21, 2019. Photo: René Volfík. “Charles University highly values the contribution of H. E. President Gauck to the development of relations between Czech and German universities in the fields of science and education. In his activities, he worked to improve mutual Czech-German dialogue, the strengthening of friendship and the development of mutual economic cooperation between the two countries in a manner unprecedented,” Charles University Rector Tomáš Zima said. A financial gift of €10,000 accompanies the international Charles IV Prize awarded to the former German president on Monday. The financial gift was presented by Milan Hašek, the Director of the Public and Non-Profit Department of Česká spořitelna (Czech Savings Bank) – a Partner of the international Charles IV Prize. 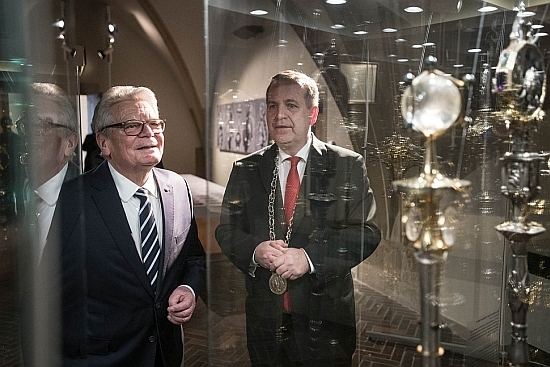 CU Rector Tomáš Zima and former president of Germany, Joachim Gauck, at an exhibition of university artefacts and symbols at the Carolinum on January 21, 2019. Photo: René Volfík. Nominations for the international Charles IV Prize are the competence of the Administrative Board of the Charles IV Prize, consisting of representatives of the City of Prague and Charles University. Final nominees are confirmed by the Rector of Charles University and the Lord Mayor of the Czech capital, Prague, who then jointly announce the winner. Česká spořitelna - a Partner of the international Charles IV Prize.